I bought a new swimsuit for our upcoming vacation. I'm barely willing to wear it out in public at all, but I definitely won't be just walking around everywhere in it. I thought I'd just buy some fabric and tie it around myself like a sarong. Long story short, that didn't work out. This is probably the first dress I've ever made without a pattern, but it's so simple a pattern just isn't necessary. I had already chopped the fabric to bits trying to get the sarong thing to work, but I think I only used about a yard to a yard and a quarter of 60" wide knit to make this. For the skirt, cut a piece of knit 24" by 50". Set aside. To make the top, find a tank you like the fit of. Try it on and mark just below the bust line with a pin. Lay the tank on top of a piece of the knit that's been folded in half. Match the shoulders to the fold. 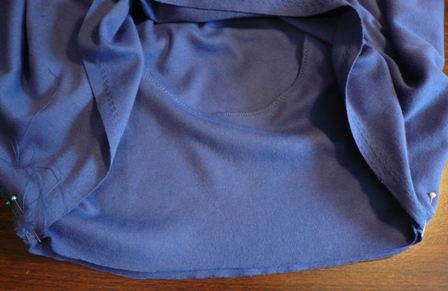 Cut around the shirt 1/2" away and across the bottom 1/2" below the pin. The other option would be to just cut off the tank and use it, but mine was the wrong color. For the front neckline, fold both shirts in half with side seams together. Line up the tops of the shoulders and cut 1/2" away from the tank. With right sides together, stitch both side seams on the top. Trim seams and zigzag. Press the seams toward the back. Turn the edges around the neck and both arms under 1/2", then turn edge to inside fold. Stitch and press. Stitch the side seam of the skirt, with right sides together and a 1/2" seam. Trim the seam and zigzag. Press the seam to one side. Stitch a long, straight basting stitch 1/2" away from the upper edge of the skirt, starting 1/4" past the side seam and ending 1/4" before it. Stitch again 1/8" closer to the edge. Leave long threads at the beginning and end of stitching. Match and pin the side seams on the skirt and the top, right sides together and raw edges even. Match and pin the other side seam on the top to the center of the skirt opposite the side seam, right sides together and raw edges even. Starting on the front of the dress, gently pull the long basting threads to gather the skirt. When the skirt is gathered enough that it matches the width of the top, knot the threads and pin the skirt to the top. Adjust the gathers as you pin so they're fairly evenly spaced. Repeat on the back of the dress. Stitch the skirt to the top 1/2" from the edge. Trim the seam and zigzag. Remove basting stitches. Press the seam toward the skirt. Turn the bottom edge of the skirt up 1", then to the inside. Stitch near the inside fold. I like this so much, no one may ever see my swimsuit.